Two of our members have just returned from Palestine, where they met Nureddin Amro in East Jerusalem and learned of the next phase in Israel’s ethnic cleansing of Palestinian communities in the city. 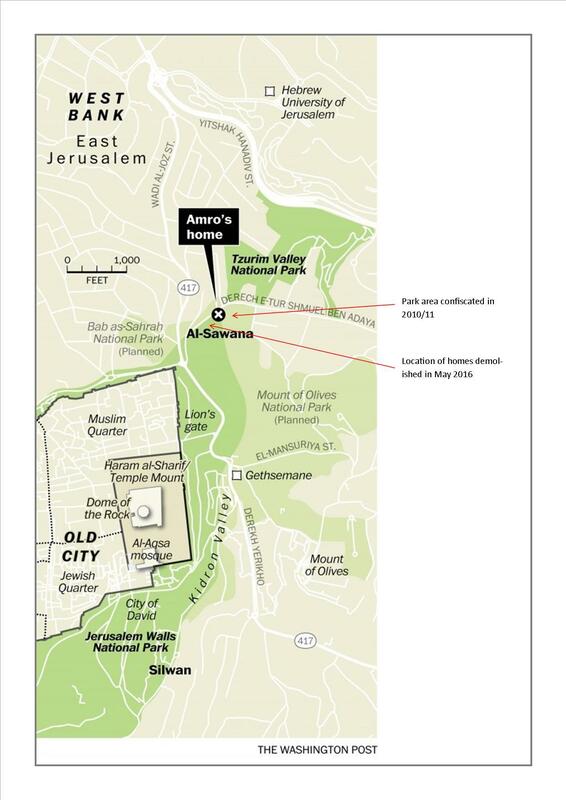 Nureddin Amro, his brother Sharif Amro, and their families live in Wadi Al Joz, just 5 minutes walk from the north east corner of Jerusalem’s old city walls. Their entire neighbourhood has been declared a national park by Israel, given the National Parks Authority extensive powers to forcibly remove all Palestinian residents from the area. The Amro’s home, where they have lived for generations, is right at the edge of the area, and they were first to be targeted in April 2015. A year later, in May two more homes were demolished. “Speak to your government and ask them to put pressure on the Israeli Government to stop the destruction of our community”. We have met with Caroline Lucas and asked her to take make representations to the Foreign Secretary and raise this issue in Parliament. support the Palestinian call for Boycott, Divestment and Sanctions. Nureddin and Sharif Amro are both blind. The brothers live with their ill 79-year-old mother, their spouses and children. Nureddin has three young children, Sharif has four; all are under 14. They were awakened at 5:30 am by over a hundred Israeli soldiers who came to demolish their home on Tuesday, March 31, 2015. Israeli soldiers pointed their guns in through the windows of the house while the children were still asleep and cut the electricity and phone lines to the house. Sharif was taken to the hospital after a soldier kicked the blind man hard in the ankle. Israeli forces refused to even let the family salvage their belongings before they tore it down. Nurredin is an incredibly inspiring man. He’s the founder and principal of the Siraj al-Quds School for visually impaired and sighted children in Jerusalem. He is a Synergos Institute Social Innovator and was recognized by the British Council for his leadership working for positive change and social development for people with special needs. Every day, when he finishes his working day at the school he as to return to a home that is half demolished and surrounded by the debris and rubble of his former kitchen and living room. According to Nureddin, there was no demolition order against the home although there have been demolitions in the neighbourhood before. They had received warnings a couple of months earlier to clean up scrap wood, wires and materials that were around the house, and they did the cleaning as required. 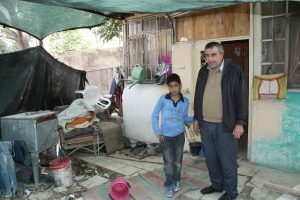 While they were demolishing the rooms of the Amro family’s home Israeli forces destroyed a fence on the neighbouring Totah family’s land, along with a shelter that housed a horse, chickens, and a dog. Soldiers also cut the family’s internet and broke the water line. The father of the Totah family was beaten, handcuffed, and arrested; he was later released. As of this writing, only a part of the Amro’s house remains standing. There is a tarpaulin roof surrounded by rubble for additional shelter. Despite the land being owned by Palestinians, Israel has annexed the area by declaring a National Park. As a national body, the Parks Authority is not required to take into account the welfare of East Jerusalem’s residents in its decisions. It also has the power to evict Palestinians without confiscating their land, thereby avoiding court challenges over ownership and demands for compensation. Jerusalem City Walls National Park established (which included parts of Wadi al Joz and Al Sawaneh) – Palestinian communities living in the area were not informed. Parkland, planted with olive and other trees, was fenced off by the Jerusalem municipality, preventing local residents from using it. Palestinian children had previously had access to this area for play and recreation (a valuable green space in the middle of the city). At the same time the road linking this community to the old city was narrowed, making it harder to access for cars and coaches. City planners, civil engineers and workers from Israel’s Nature and Parks Authority came to area. They ordered people to clean up the area (people complied), measured the area with surveying tools and spray-painted footpath markings for hikers. They told Palestinians that they lived on “public land” inside something called the Jerusalem Walls National Park (established in 1974), and warned that there were plans for further work. Two family homes demolished, just the other side of the coach park from Nureddin Amro’s House. Both houses have been completely destroyed and much of the belongings destroyed, mixed up with the dirt and walls of the homes. The 14 members of Aref Totanji’s family remain homeless. In the devastation of the rubble of their home the family’s possessions are piled in black bin bags under a tarpaulin. The broken remains of the household goods they managed to salvage are lying amongst the masses of broken concrete and rubble which is all that remains of their home. The family has nowhere else to go. This has included extensive demolitions and take-over of Palestinian homes in Silwan, Sheikh Jarrah, Jabal Albaba & El Essawiya (near Abu Dis) and the creation of the E1 plan for settlement expansion around Ma’ale Adumim. BIMKOM, a group of planning experts helping Palestinians negotiate Israel’s labyrinthine planning system has produced clear evidence of the way Israel is using National Parks to drive Palestinians in East Jerusalem from their land. ‘The consequences for Palestinians living in these parks was devastating’, said Masri of Bimkom, ‘because this process makes demolitions easier to secure’. Such a loss of areas of open land in East Jerusalem to national parks is stripping Palestinians of any hope in future housing for the next generation. The Israeli government appointed Elad to run City of David, the Jewish archaeological site in Silwan. Peace groups and investigative journalists have been warning for years about the role Elad plays in changing the demographic and political reality in East Jerusalem. Israel seized East Jerusalem during the 1967 war, in which it completed its occupation of all Palestinian land. Israel unilaterally expanded the boundaries of Jerusalem by annexing some 70 sq kms to the municipal boundaries of the West Bank area and evicting over 6,000 Palestinians from the Old City’s Mughrabi Quarter in order to create a plaza in front of Al-Buraq (the Western Wall). Israel then declared Jerusalem its capital. East Jerusalem was annexed shortly after the war in a move that has not been recognised by the international community or the Palestinians. Under the Fourth Geneva Convention (Israel is a signatory) – an Occupying Power is prohibited from destroying property or making use of collective punishment. Under international law East Jerusalem is occupied territory, therefore, the Israeli practice of demolishing Palestinian houses is illegal. The Palestinian families in the area are receiving legal support from Norwegian Refugee Council through their Information, counselling and legal assistance (ICLA) service. We believe that this service is part funded by DfID. Next to the destroyed homes is the coach park for the buses that bring the Muslim pilgrims to pray at the Al Aqsa Mosque. Local people believe that the narrowing of the road for the creation of the national park and possible future demolition of the coach park is part of Israel’s plan to limit Palestinian access to the Al Aqsa Mosque. Wadi al Joz and Al Sawaneh (sometimes spelt As Sawaneh, As Sawana or Al Sawana) are old Palestinian communities just outside the north-east corner of Jerusalem’s Old City walls. In the last year three Palestinian family homes located at the intersection of these two communities have been demolished. 12 more are under immediate threat, and there is serious concern for a further 50 homes.